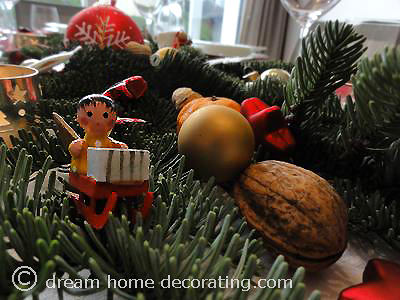 This little musician is one of our oldest Christmas tree figures. 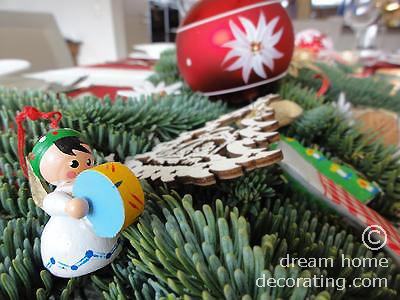 When we decorated the table for Christmas this year, we got inspired by the materials we had in the house. tea lights placed in chromatic candle holders with christmas tree shaped holes. 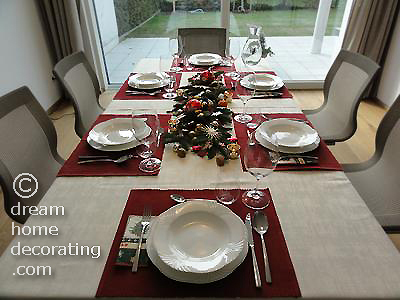 The centerpiece is quite colourful, so we kept the background simple with a white linen tablecloth and placemats in muted red. This one is out-of-this-world! Very special and personal, almost magical. Sitting there would have felt like in a fairytale. This centerpiece looks so fun! These photos remind me why I prefer REAL fir/pine/spruce branches to fakes. Yes they resinate, yes they needle, but they look (and smell!) infinitely better. 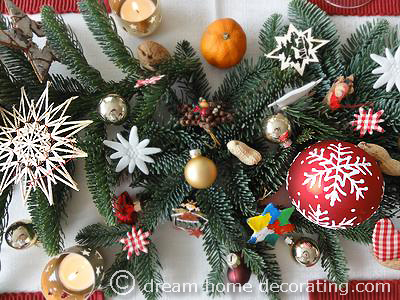 Hello Ursula & Hans, thank you very much for sharing your beautiful Christmas table decoration! What gorgeous photos, I love your eye for detail. Your centerpiece is an intriguing combination of old and new, handmade and store-bought, natural and created (and that's one sophisticated straw star!) Thank you for allowing us a peek at genuine Old-World Christmas decorating.